I’ve been gluten-free for over four years now. To me it’s just part of my everyday life. Every time I try a new product I always read the ingredients and make sure it’s something I can eat. 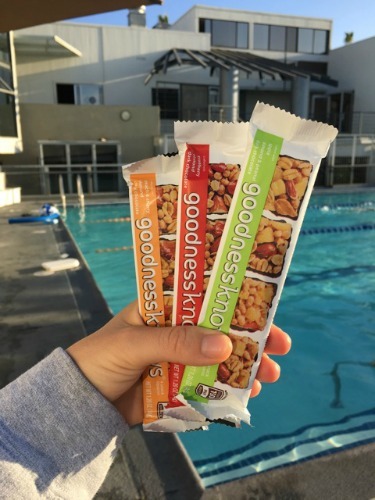 When I was first contacted by goodnessknows earlier this year, I asked them if their snack bars were gluten-free. They said they were, and the official gluten-free packaging would be launching later this year. Well guess what? It’s here! You may remember goodnessknows from the bike ride I attended with them earlier this year in Santa Monica. It was a highlight for me because I won a sweet bike! Then I rode that bike in a triathlon. So much fun! 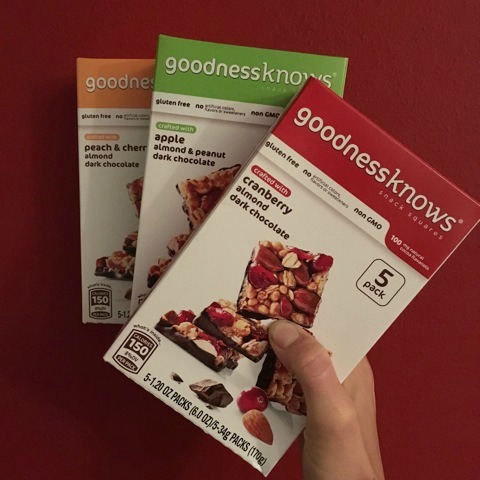 I have really enjoyed having goodnessknows on hand as a snack over the past several months. I keep them in my purse, my diaper bag, and my work backpack. At BlogHer 2016 I heard my pal Anne Hogan’s stomach grumbling and gave her a bar. She loved it, too! Each bar is divided up into four squares and they taste really good. My personal favorite is the Apple one. 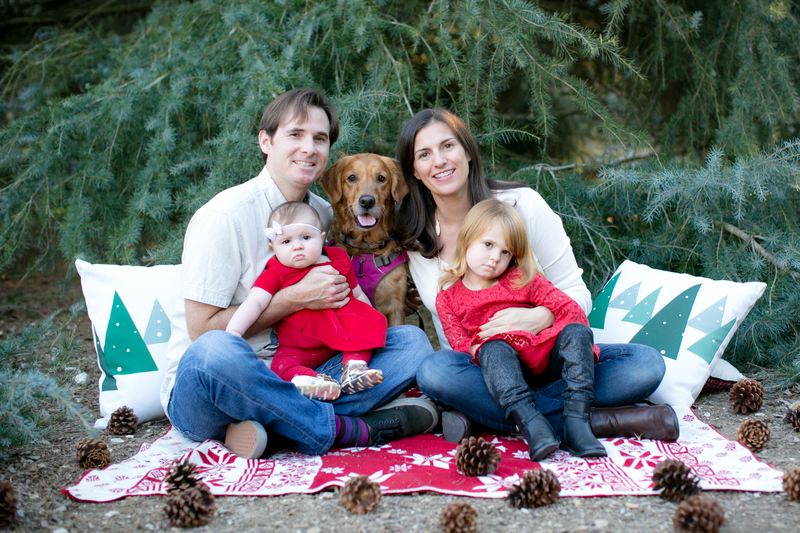 We’re now entering the time of year where being gluten-free tends to get a bit trickier with the holidays. Halloween is hard for children with gluten allergies and especially for parents of children with gluten allergies who have to sort through their trick or treating goodies. 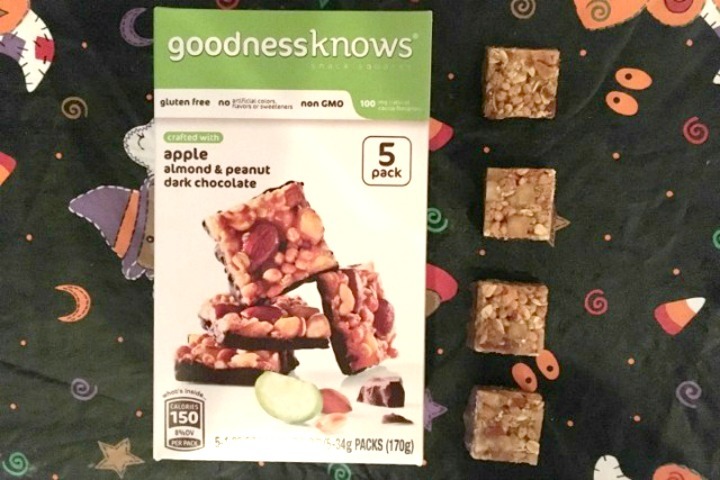 I’ve been thinking about handing out goodnessknows bars as a gluten-free option to trick-or-treaters at our house for Halloween this year. I think the kids in our neighborhood would dig it. You can find the new product packaging in stores that is marked “gluten free” on the label. I found them at my local Vons. To find where you can purchase goodnessknows near you, you can check here. They come individually or 5-packs. They’re made with whole nuts, fruit, toasted, oats, and dark chocolate and are made with no artificial colors, flavors, or sweeteners. For goodnessknows, going gluten-free is just another small step they are taking to go from good to great, and it’s one that I can say is much appreciated by the gluten-free community. 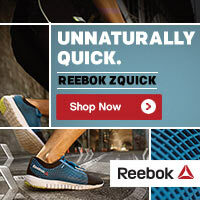 Check them out and let me know what you think after you try a little goodness! Awesome Fridays 7/12: Manhattan Beach in the News, Great White Sharks..eek.